The Kings will face a pair of lower mainland teams at the 4th annual BCHL Showcase in Chilliwack. The Kings and Coquitlam Express will open the Showcase at 10:00am on Thursday morning, then the Kings will turn around and be on the ice 24 hours upon completion of game 1, with a 1:00pm puck drop against the Surrey Eagles. The Eagles will be a little on the ropes for their contest against the Kings, having played the night prior against Merritt. Not a great schedule, as in previous years the Kings had featured in at least 1 “prime” game at a 7:00pm start. However the league this year increased the length of the Showcase to avoid playing any games on the secondary sheet (although Vernon/Wenatchee will still be over there), so the odds of getting a “prime” game changed a bit. The team went 0-2 at the Showcase last season, dropping 1 in regulation and 1 in overtime. It should be noted that although it hasn’t been confirmed, it’s widely speculated that the Showcase will NOT start the BCHL season, with at least 2 weekends of home and away play expected to feature before all the teams gather in Chilliwack. For those new, the Showcase ARE regular season games that DO count for points in the standings. They are neutral site where the Kings will be on the home bench for one game (vs Surrey) and on the visitors bench and last change for the other (Coquitlam). The Wenatchee Wild will join the BCHL as its 17th franchise starting with the 2015-16 season, the team and league announced Monday at a media conference held in the central Washington city. The Wild had been a member the North American Hockey League (NAHL) since the 2008-09 season. They have had a winning record in each of their seven seasons of existence and this past season, they had six players on their roster committed to NCAA Div. I programs. Playing out of Wenatchee’s Town Toyota Center, the team averages about 3,000 fans at home games. Head coach Bliss Littler, a native of Minot, N.D., is entering his 22nd year as a Junior hockey coach. As a U.S.-based club, the Wild will be allowed to roster a maximum of four Canadian players. With today’s announcement, they become the first U.S.-based franchise in the BCHL since the Bellingham Ice Hawks, who operated from 1990 to 1995. The league has taken the first step in gearing up for ‘next’ season, barely a week after ‘this’ season wound up at the RBC Cup in Portage, SK. The league will hold its 4th annual Showcase event at the Prospera Centre in Chilliwack. What is it and is it exhibition? The Showcase is an event that sees every team in the BCHL play 2 neutral-site games for regular season points. Typically teams play one game as the home team and one as the road team, but scheduling quirks don’t always afford that opportunity. Despite one game likely being a “home” game for the Kings, both will be played in Chilliwack. Why? To allow NCAA, WHL and pro scouts an opportunity to see every team and player in person at one venue at one time. Why is it always in Chilliwack? For the past three years, Chilliwack has hosted it due to its central location and dual rink setup with two ice sheets right next to each other (not unlike Powell River). It will host again, despite all games being played in the one rink. This move opens up other venues to host the event in the future. 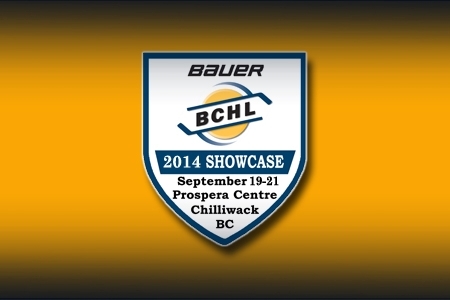 The British Columbia Hockey League is pleased to announce the Chilliwack Chiefs and Prospera Centre as the host team and venue for the fourth annual Bauer BCHL Showcase, happening Sept. 24 to 27, 2015. An extra day has been added to this year’s Showcase in order to allow all games to be played on Prospera Centre’s main ice surface. Since the first Showcase was held, the BCHL has had 12 players selected in the NHL Entry Draft with another five projected to be drafted this June. Over the last three seasons, the league has also averaged 132 players with college commitments, 114 of those to the NCAA Division I level. The ability of scouts to evaluate players will only be enhanced this coming September as Prospera’s main sheet of ice will be used exclusively, which will also improve the fan experience at the Showcase. “The Chilliwack Chiefs and Prospera Centre are proud to again welcome the university and professional hockey scouts of North America as well as Junior hockey fans from across the BCHL,” said Chiefs president Glen Ringdal. All the matchups for the 2015 Bauer BCHL Showcase will be released after the conclusion of the league annual general meeting June 4 to 6. The Kings are 3-2-0-2 at the Showcase’s 3-year history, with wins over Chilliwack, Salmon Arm and Vernon. 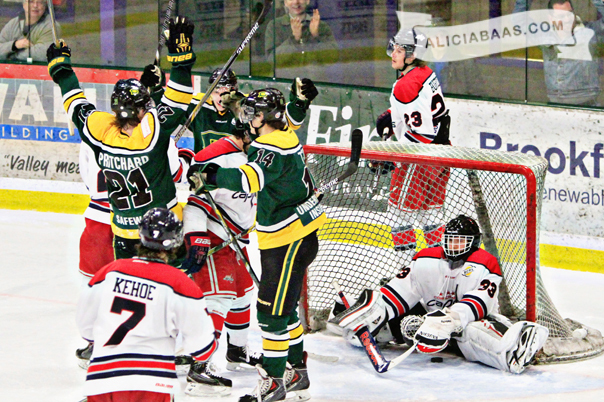 The Kings went 0-2 last year dropping games to Chilliwack and Trail (in overtime). If you’re not at the Frank Crane Arena on Friday night, or maybe you miss the live call of the game on FastHockey and the Network, then you can catch up with the Kings vs Clippers game on Shaw TV. The game will air in its entirety as part of an experience for the company, who is looking to add more BCHL content to its lineup of stations up and down Vancouver Island, covering the Sunshine Coast too. The game will feature Clippers broadcaster Dan Marshall and his crew calling the action. Expect more games to be covered next season, with the goal of the project to cover all the Island teams throughout the year as they move through the Frank Crane Arena. With the playoffs less than three weeks away, the British Columbia Hockey League is announcing it will stick with the same postseason arrangement as last year. Regular-season games will conclude on Saturday, Feb. 28 and the first playoff games will be Tuesday, March 3. The top-four teams from each of the three divisions will qualify for the playoffs for a total of 12 teams. In each division for Round One, the No. 1 seed will face the No. 4 seed and No. 2 will play No. 3. Round One must be played between the dates of March 3 to March 11. Round Two must be completed between March 13 and March 22. Round Three must be completed between March 25 and April 5. The Fred Page Cup Finals will be played between April 10 and April 19. The first, second and championship rounds of the BCHL playoffs will be best-of-seven series. It will be up to the opposing teams in each playoff series to determine the format of the seven games (2-2-1-1-1 or 2-3-1-1 or 1-1-1-1-1-1-1, etc.). After the second round, there will be three division champions left standing. As in 2014, these three teams will play a double round-robin tournament with each team hosting the other two in their home arena. This round will eliminate one team and the remaining two will advance to the BCHL Finals to play for the Fred Page Cup. The BCHL champion will go to the Crescent Point Energy Western Canada Cup which will be held April 25 to May 3 in Fort McMurray, Alta. The top-two teams there will advance to the RBC Cup national championship, which will be May 9 to 17 in Portage-la-Prairie, Man. In short, it’s a lot of hockey in a short space of time…especially in that first round. 7 games in 9 days is a tough slog and several in the league have expressed a concern over the quality of play with that kind of schedule. That being said, it’s playoffs. The Kings still don’t know what will be home or away in the 1st round, as the team is still at least a couple of games away from securing 2nd in the Division. If the Kings finish 2nd, game 1 will likely be at the Hap on Tuesday March 3rd. If the Kings slip to 3rd, they play games 3 and 4 at home on the following Friday and Saturday nights. Congratulations to Jacob Pritchard and Adam Tracey, both earning Honourable Mentions for the BCHL Player of the Week Award. Pritchard was a force in all four games played during the last 7 days, scoring 5 goals and assisting on 4 others. He earned a pair of 1st star nods, a third star and scored the game winner in Nanaimo in overtime. 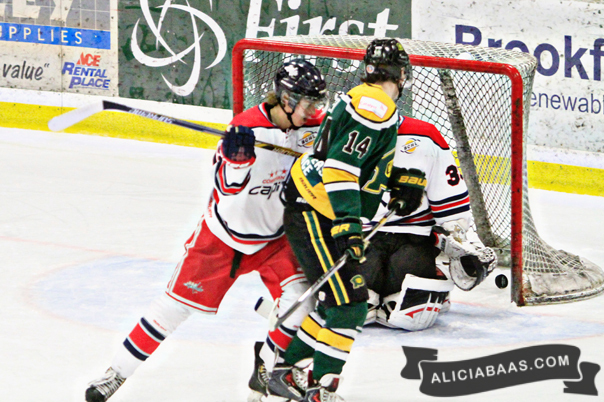 Tracey had 4 goals in the last 4 games, including a pair on Saturday night late in the 3rd period to help the Kings clinch a playoff spot against the Cowichan Valley Capitals. Along the way, he also earned a 2nd star nod, and probably would have had 1st star on Saturday night if not for early submission of the 3 stars. The award was understandably taken out by Salmon Arm Silverback netminder Angus Redmond who let in 1 goal over 3 games, posting a 0.34GAA and .989sv% en route to a 2-1 record. Salmon Arm Silverbacks goalie Angus Redmond has been named the BCHL Player of the Week for the week ending Feb. 1, the league announced Monday. Redmond stopped all but one shot he faced over three games and posted consecutive shutouts over division-rival Vernon. The Langley, BC product allowed his only goal against of the week in a 1-0 loss to Penticton but was still named the game’s 2nd Star. On the road in Vernon, he stopped all 31 pucks in a 3-0 victory and took 1st Star. The following night at home, he again was 1st Star in a 1-0 win where he made 17 saves. The Michigan Tech recruit posted a .989 save percentage for the week and a tiny 0.34 goals-against average. Redmond is now tied for the BCHL lead with five shutouts on the season. The calendar reads June, but today’s announcement from the BCHL says that the 2014/2015 season is right around the corner. The league today announcing the Showcase matchups for the 3rd annual event at the Prospera Centre in Chilliwack. For those unfamiliar, the BCHL Showcase consists of two regular season, neutral site games for each club. It is a great event for fans and scouts to see a large number of players in a short period of time. 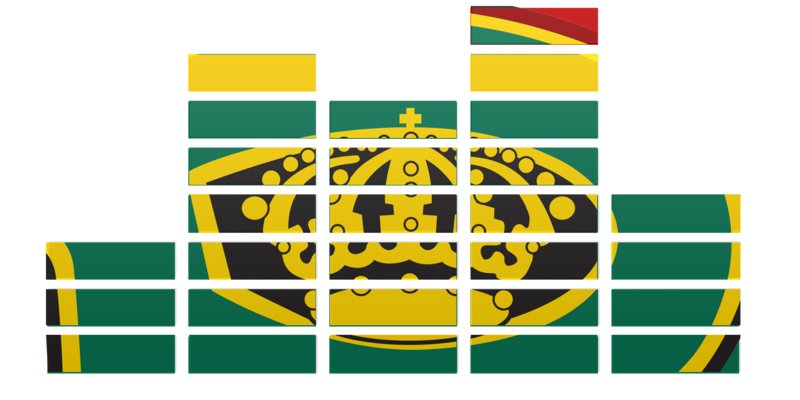 The Kings season will start on Saturday September 20th against the host Chilliwack Chiefs. It’s the 2nd straight year the Kings have opened up against Chilliwack, with Powell River earning a 6-1 win to start the 2013/2014 campaign. Then it’s a quick turn-around to a 10:30am start on Sunday morning against the Trail Smoke Eaters. It’s another team that Powell River is used to seeing early in the year, as the two clubs took part in a pre-season tournament in Trail for a few years a number of seasons ago. For those concerned about the short turn-around, it’s something the Kings are somewhat used to. Last year the Kings played a similar Saturday night/Sunday morning schedule and returned to Powell River with a pair of big wins. For the other 56 games on the schedule, I’d expect to see that released late this week or early next.